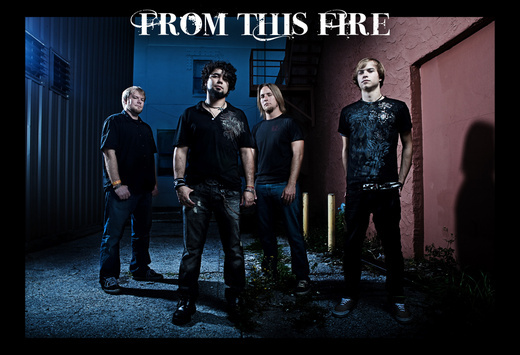 From This Fire is a hard rock/alternative metal band based in the Tampa Bay Area. Merging heavy guitar riffs with open melodic choruses, FTF joins Metallica with Breaking Benjamin, all the while burning with the embers of Avenged Sevenfold and Bullet For My Valentine. They bring a highly energetic vibe that speaks swagger and attitude in the music. And while they're the type of band that won't shy away from laying their hearts and experiences on the line, their affable personas will have the entire venue engaged. FTF has performed with other awesome bands such as Candlebox, Sick Puppies, Alelitas Way, Framing Hanley, HURT and others. The band isn't afraid of using their brutal honesty to get their point across. Their live shows are the very thing they use deliver their fiery vision. Passion breeds passion. Excitement begets excitement. This is no more evident in seeing the foursome perform. You can get the CD. You can get the shirt, wear it proudly. But to see the band live is to believe once you believe; you will finally know what comes From This Fire.